Anyone who wears makeup has faced the agitating experience of staining their beautiful clothes with foundation stains. However, getting a foundation stain does not mean you have to dispose of your outfits! If you are looking for some easy tips on how to remove foundation stains from clothes, check out some of my favorite tips that will help you get rid of foundation stains within minutes! Use a foaming type of shaving cream for this method, as the gel type will not work as efficiently. Spray the foam shaving cream directly on to the foundation stain on your clothes. Allow it to sit for a couple of minutes. Use your fingers to work the shaving cream into the clothes gently. You can also use a soft cloth to rub the stain directly. Rub the shaving cream in firmly onto your stained garments. In case the stain looks a little more stubborn, you can add a few drops of rubbing alcohol and use your fingers to work into the stain. Wash out the stained area of your clothes under cold water first, as warm or hot water might cause the stain to set in even more. In case there is any stain left, repeat the treatment and wash it off with warm water this time. Using tissue papers or paper towels gently blot the area to lift off any remaining stain from the clothes. Launder the clothes, as usual, to wash out all the makeup off your clothes. Use a spray bottle filled with water to dampen the stained area of your clothes, but make sure you don’t soak it entirely. Just moisten it slightly. Use cold water only for this. Squirt a few drops of any dish soap on to the area directly. Let it sit for a few minutes. Be sure to use dishwashing soap and not laundry detergent, as this would be much harsher on the clothes. Use a toothbrush or just your fingers to work the soap into the stained area. Rub it slightly if required but be gentle with it. Take a paper towel and gently blot the area to lift off any stains from your clothes. Rinse out the remaining soap from the clothes by running the clothes under cold water. If some stain remains, merely repeat the process. Launder the clothes as you would normally. Detergent wipes contain chemicals which interact with the foundation stains on your clothes and help lift them off. Rub the detergent wipe on the foundation stain on your clothes in gentle, circular motions. Rinse off the stained fabric under cold water and gently rub at it till you’ve successfully removed all the foundation stains. Apply baking soda on the stain and rub it using a soft brush. Spray the hairspray directly on to the stained area of your clothes and allow it to sit for a few minutes until it hardens. You can also apply a few more layers of hairspray if you see that it is not solidifying quickly. The hair spray has the ability to remove the oils from he foundation stain. Take a clean towel and run it under cold water. Wring out the excess water from the paper towel so that it is damp, not wet. Push the towel down gently on the foundation stain of your clothes and blot out the stains. You will see the paper towel getting saturated with the foundation stain and the stain lifting off from your clothes. 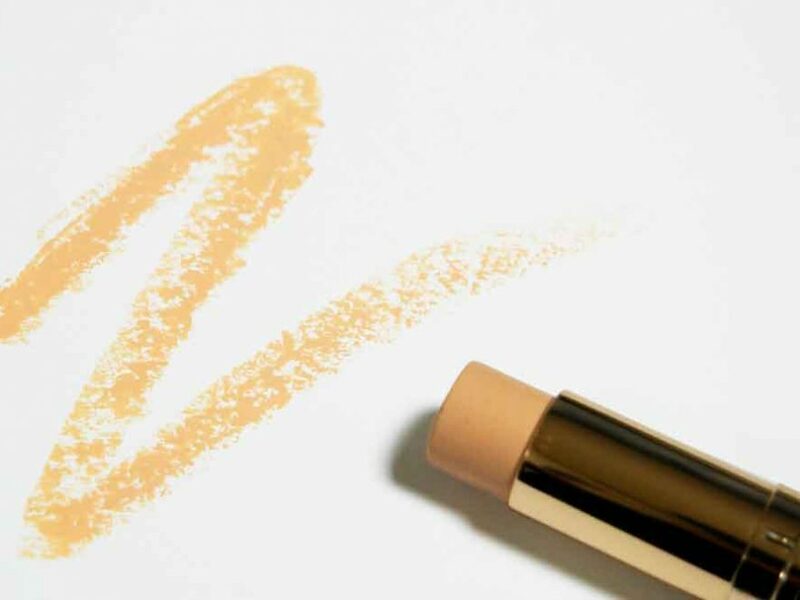 Keep doing this until you’ve removed all the foundation stains. Launder your clothes as you normally would and let them dry naturally. Use a plastic knife to scrape off any excess foundation stain from your clothes. Be careful not to spread the stain further into your clothes. Take an ice cube and start working it into the foundation stain on your clothes. Keep rubbing it in gently using circular motions. You will see the foundation stain slowly lifting off the fabric. You may want to hold the ice cube with a paper towel if it feels too cold against your fingers. Dab the stained area with a paper towel and blot off the foundation stains remaining. Take just a few drops of glycerin and apply it directly on to the stained area of your clothes. Using a paper towel, gently blot off the glycerin from your clothes. You will find the foundation stain lifting off as well. Be sure not to use a rubbing motion as this will spread the stain further into your clothes.